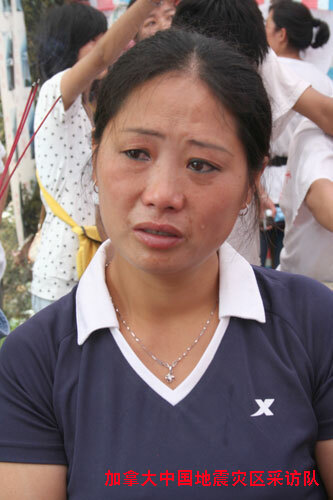 (加拿大中国地震灾区采访队记者Christina Stevens6月20日报道) It’s our final day here, and to be honest it started off badly. We planned to go to a mountain town deep in Shei Fang County, but that was not going to happen. Instead, we spent endless time waiting and arguing with police at checkpoints. We were singled out and stopped, while other cars zipped past. First we were told it was dangerous, then we were told there were fears of disease; but a farmers market teeming with people and products seemed to rule that out. Eventually we talked our way a short distance into the county, to the town of Lou Shui. Then, with officers at our sides we had a few minutes to look at yet another crumpled heap of concrete, steel and glass. What made this one different is that it was a high school. Next to it, on the street corner, a memorial to students is crowded with mourners. Red candles and incense burn in the midday heat and the grief is tangible. I look up and catch the eye of one of one women. She is weeping so much that tears run down both cheeks and drip off her face. You don’t have to speak a word of her language to understand. I try to convey how sorry I felt, hoping she would somehow understand my gestures. She appeared to, first nodding, then pointing. I turned to see a photo of a teenaged girl, grinning at the camera and holding wreaths of flowers in both hands. This was her daughter. I told her I understood, and that she was very beautiful. The woman turned back to her incense. Her face is an image I will leave with. Looking back, as we drove though one disaster area after the next day after day, at times the enormity of it was overwhelming. So many people, so many stories of loss, so much sadness. As a journalist, dealing with death was nothing new, but nothing could prepare me for this. Although a certain distance is required to tell the stories (and to cope) I confess, here I cried. At this time the talk is of recovery, there are tributes to heroes, and in some areas the first bricks are being laid as rebuilding begins. Still, nothing, nothing can stop my heart from aching: for the boy who lost his mother, the father who lost his children, and most of all for entire families and villages who have no one left to mourn them or even remember them. The tears come, but I wipe them away. To every survivor I met I added my own encouraging words of hope, but I know it wasn’t enough and I am left feeling helpless. All I can do is let them know people care. People on the other side of the world care, for each and every one of them, individually as human beings. The reason is simple and clear, a mother’s grief is the same the world over, you don’t need words to understand it. 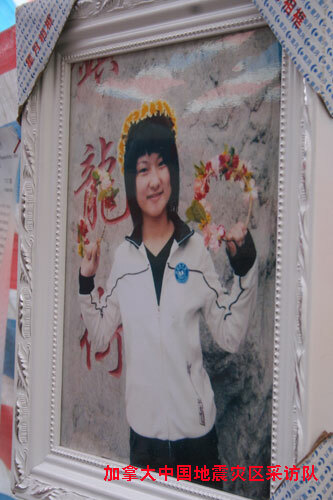 Mother’s 17 year old daughter killed in Lou Shui High School.